Jess loves this blog called The Pioneer Woman. It’s the blog of a lady that came from a small town, then went to a big city in Cali, then fell in love with the a cowboy and now resides in the middle of nowhere. She keeps a blog of her life. In fact, her life is so interesting that a gazillion people go to it every day. 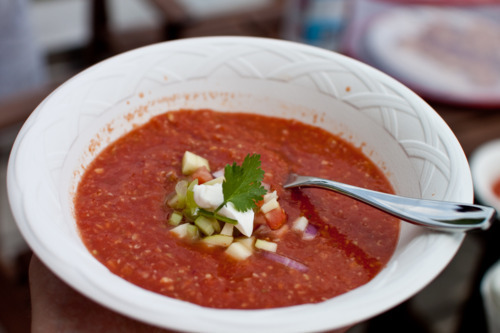 The Pioneer lady has some pretty good stuff, one of them being this Gazpacho recipe. I’ve always avoided Gazpacho because I always confused it with Gestapo. Everyone makes this mistake right? Honest mistake. It looked like there were no Nazis in the recipe, so we decided bust out the food processor and try it out. We picked up from fresh ingredients and got to work. This recipe asks you to dice everything, so I started to mindlessly do that. But half way through and 15 minutes later, I realized that you have to throw most of it in a food processor. I’d recommend dicing a quarter of the ingredients and just rough chopping the other parts to save lots of time. Tip: Make sure you know the liquid level limits of your food processor. Ours spilled over because we took too many liberties. After you cut everything up and throw it in the processor, make sure you chill the concoction. I would even throw it in the freezer for a few minutes before serving to get extra chill. There some extra garnishes too (cilantro and sour cream) that are a nice to have, but go a long way for presentation. Here’s the Pioneer Lady’s gazpacho recipe, modified for cutting tips. 6 dashes Tabasco or some chipotle adobo sauce if you’re making this. In the bowl of a food processor or in a blender, combine the minced garlic with half the red onion, half the cucumber, half the tomato, half the zucchini, half the celery, half the tomato juice, olive oil, red wine vinegar, sugar, Tabasco, and a dash of salt. Pulse until all ingredients are blended well; mixture will have a nice speckled, colorful texture. Stir mixture together and check seasonings, adding salt if needed. Chill soup for at least a couple of hours; soup needs to be very cold! Remove the soup from the fridge and stir. Check seasonings one last time. Ladle into a bowl and garnish with remaining diced vegetables, a sliver of fresh avocado, sour cream, and cilantro. Finally, place a grilled shrimp on the top and serve with grilled slices of bread. This is a to-die-for summer dinner.